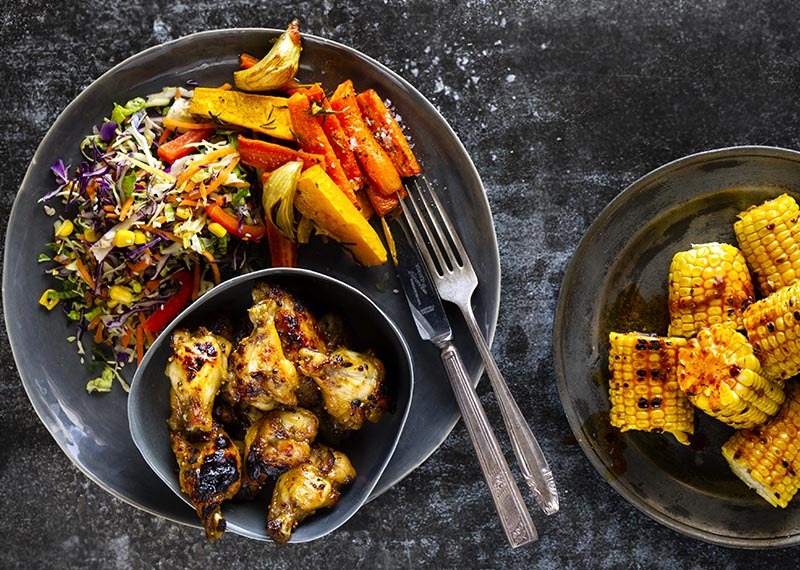 with crunchy asian slaw salad, sweetcorn with chipotle butter with lime and rosemary and garlic roasted root vegetables. 15 to 20 minutes, turning occasionally, until tender and caramelised. With a sharp knife, divide each cob into 3 pieces. Melt the 3 Tablespoons of chipotle butter with lime and pour over the corn pieces. Cut the onion, butternut, potatoes and carrots into large wedges. Toss the vegetables with some olive oil, 1 clove of crushed garlic and a few sprigs of rosemary. Season. Roast at 180C until tender and crisped.